Brady Polystyrene ANSI Caution Sign: THIS MACHINE MUST BE LOCKED OUT PRIOR TO SERVICING. 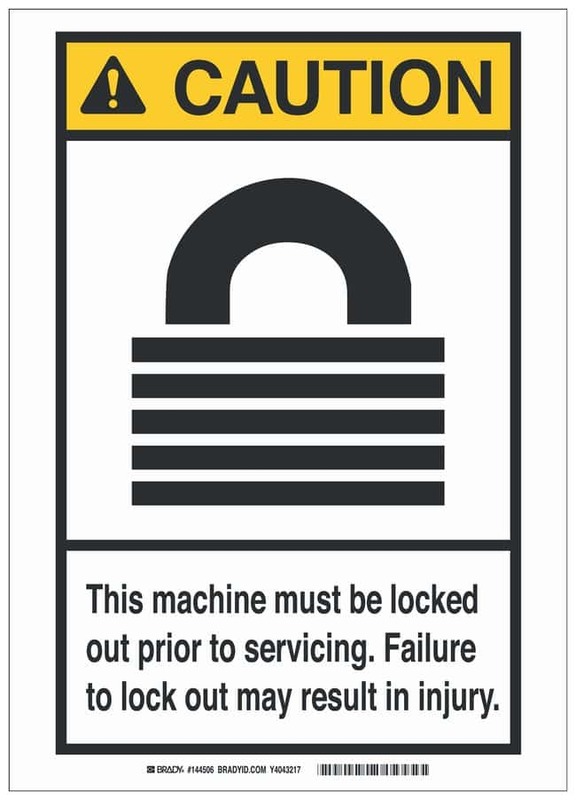 FAILURE TO LOCK OUT MAY RESULT IN INJURY . Improve workplace safety with proper signage and markings. This Brady corner hole mounted sign is a durable, clear and effective tool to clearly mark lockout and tagout areas. Message THIS MACHINE MUST BE LOCKED OUT PRIOR TO SERVICING. FAILURE TO LOCK OUT MAY RESULT IN INJURY . Size (English) 7 in. x 10 in. x 0.0591 in.